Get free sample Employee HR forms for your business to customize and print such as Employee Absent Request, Weekly Absence Record, Emergency Information and Employee Referral. HR forms such as the Employee Absence Request form is to help keep track of your employees’ whereabouts or absences – a key responsibility for any human resources representative and are often required for the Human Resources office. The Employee Absence Request form gives you answers to questions such as the type of absence requested (sick, vacation, bereavement, time off without pay, military, jury duty, maternity/paternity and other which leaves space to explain the type of absence request. 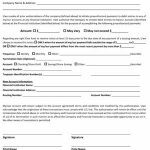 After completing this form the employee dates and signs the form and then turns it in for manager approval or rejection. After the manager signs the form with the approval or rejection, a copy of the form is sent back to the employee who completed the form. I have two different free forms available below to choose from. The Employee Referral form is utilized when an employee wants to refer someone for hire at your company, and in some cases a referral award might apply. To refer a potential employee, you have to complete the form and return it, along with a copy of the prospective candidate’s resume, application, or both, to the Human Resource department. In the case of this form, only one referral award can be given per candidate. If a candidate is referred by more than one employee, the first referral received will be the one rewarded if the candidate is hired. The Weekly Absence Record below is a form for managers to track their employee’s absences by each week.